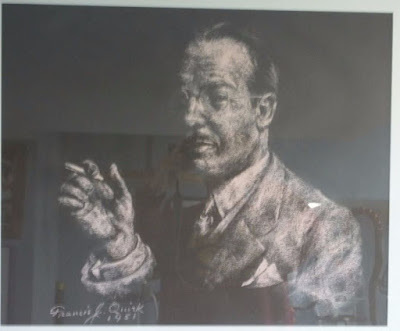 A pastel portrait by Quirk has surfaced in Plymouth Meeting, Pennsylvania and we are seeking to learn more details about it and its history. The seller described it as a portrait of a 1950's gentleman in a 3-piece suit, smoking a cigarette. It is executed in light burgundy on black artist paper, creating the effect of the subject coming out of the shadows. We also are seeking better images... If/when we obtain them, we will share them with you.